S.O.S I have cut ties with my college meal plan. This summer, I was equipped with a skillet, crockpot, induction cooktop and a multitude of spices and grocery store goods. If you know me, cooking is not my favorite activity, but I love to eat. You would think the two factors would mix well, But I honestly never truly gave cooking a chance. Pinterest has been my go-to for meal ideas, allowing me to create a suitably titled College Meals board. 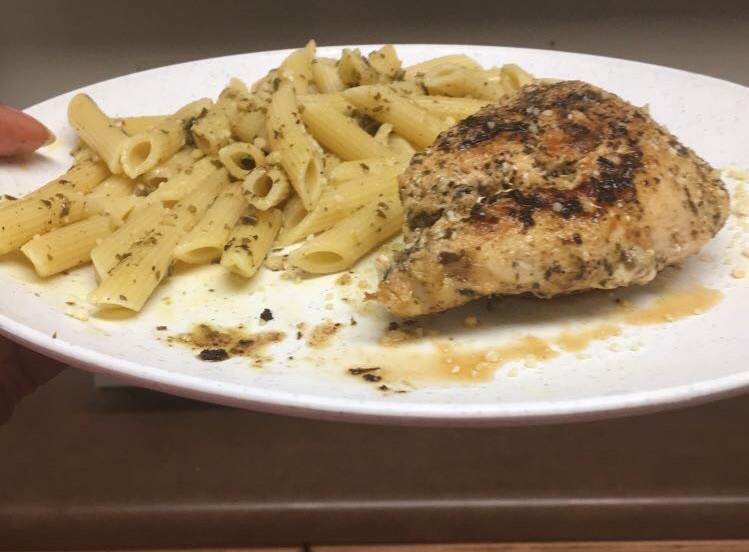 One of the best recipes I’ve found in my chef journey has been pesto pasta chicken. Start off by thawing out a chicken breast in bowl of water. A rule of thumb is to thaw out your meat earlier in the day in order to get your dinner going as soon as possible! After thawing, drain the water then add salt, pepper, Italian seasoning. 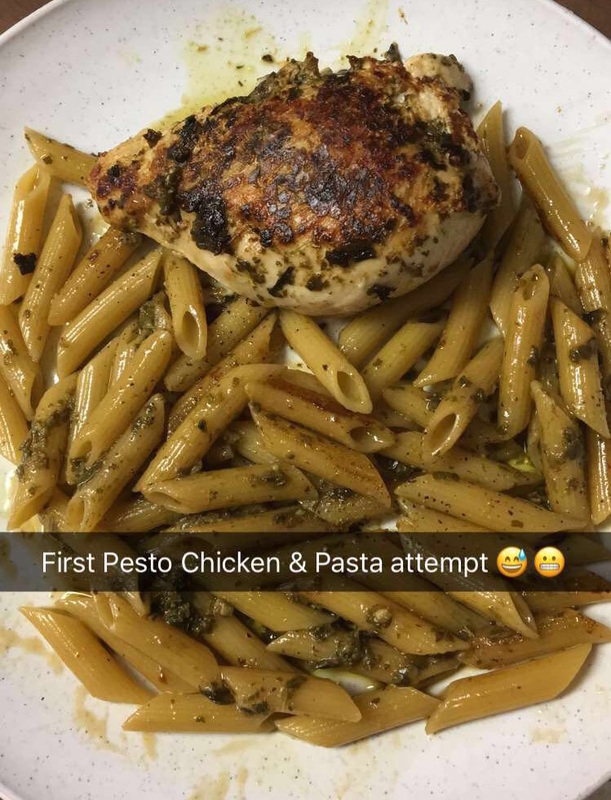 Finish up by rubbing on some pesto to the breast. Begin heating the skillet and when warm, add your chicken breast. I like to cook each side for about 7 minutes each before flipping. Then I continue warming in the skillet until the breast is thoroughly cooked. Once the chicken is close to being done, I turn down the skillet temperature and begin to prepare my noodles. Bring a pot of water to boiling point, then insert a handful of noodles. I like to ensure I make only one serving size, which is typically 1 cup of dry penne noodles. Let the pasta get tender then drain the water using a strainer. At this point, place the noodles and chicken on a plate and drizzle with pesto sauce topped with parmesan cheese crumbles. Voilà! You now have a complete, easy and inexpensive meal that any college girl (or guy) can complete in any dorm room. Add as much, or as little pesto, as you desire. You can even try baking the chicken in the oven as oppose to the skillet. Whatever you choose, let us know how it turns out in the comments below! Favorite website hands down and the meal looks great! I will definitely have to try!